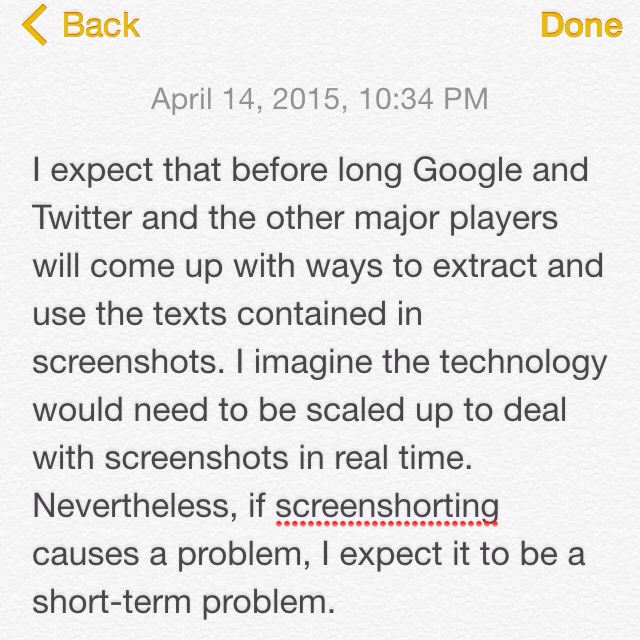 Are screenshorts slowly killing blogging as we know it? For some things, I think so, because it’s an easier and more authentic way to reach your fans, friends or followers directly on social media than it is to spend time setting up a blog and then sharing out the link. Sharing text as an image has other benefits too: it helps increase shareability on social media because we respond better to visuals versus text. A test by Buffer found that it leads to 150 percent more retweets than a tweet without an image. If that’s true, it’s no wonder everyone’s blogging as an image. —The Next Web. 14 Apr 2015 in Cyberculture, Design, Media, Modding, Technology, Weblogs.